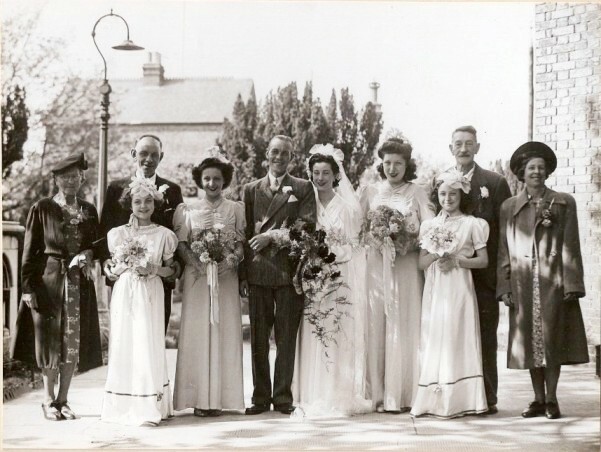 Lynn Hayter has provided this photo taken at the wedding of Thomas William Hutchinson & Iris Joan Millward at Holy Trinity Church, Hounslow, Middlesex on the 20 Apr 1946. The groom is Lynn's second cousin. Front row from left - first bridesmaid unknown to me, second bridesmaid Ena Stone (my sister), bridegroom Thomas William Hutchinson (my second cousin), bride Iris Joan Millward (born in Brentford on 21 Jun 1923), third bridesmaid is Grace Millward (sister of the bride), fourth bridesmaid unknown to me. Back row from left - Harriet Eliza Stone nee Hutchinson (my gandmother), William John Hutchinson (father of the groom and my great uncle), Frederick T. Millward - I think (father of the bride), Annie Millward nee Bird - I think (mother of the bride & born at Providence Place, Brentford U.S.D. on 22 Feb 1885). Lynn adds 'The Hutchinson's mentioned are all descended from Charles James Hutchinson and Ann Maria Haywood and were all born in Brentford except Thomas William Hutchinson, the groom, my second cousin, who was born in Hanwell'. See also the Hutchinson family page.